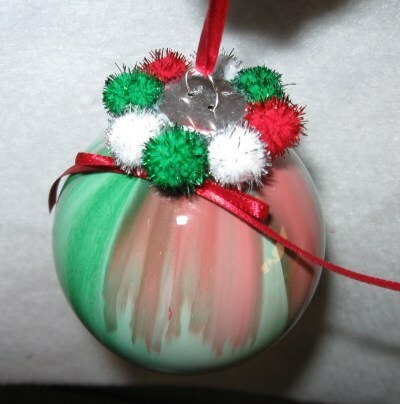 Painting glass Christmas ornaments can become a tradition in you household. They are great as gifts too. This is a guide about painting glass ornaments. Creating a personalized, ornamental ball for the tree can be as individual as you like. 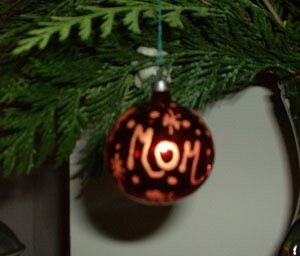 Mine are red balls with golden glass paint depicting a design and each loved one's name. Before you start, clear the table and cover it with newspaper or a large garbage bag to avoid getting paint on the table. Start by creating a template of the design you want to paint with pencil on a piece of paper. Incorporate the name of a loved one into the design. Take out your Christmas ball. Cut a length of thread from the spool and thread it through the hoop on the top of the ornament. Create a loop to hang your completed ornament by. Once your design is ready, open your bottle of glass paint. Remove the cap and screw the writing tip onto the end of the bottle. 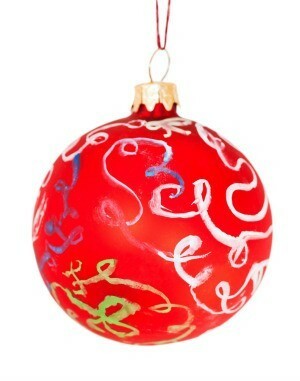 Copy your design onto the Christmas ball. Hang the ball on the tree or from a hanger to dry. Complete steps two to five for each personalized ball you want to create. To make beautiful homemade Christmas tree ornaments, pour or squeeze craft paint, your choice of colors, into clear glass bulbs. Twirl the bulbs around, holding your finger over the open top, and watch the paint swirl around. Use paint sparingly until you get the hang of it. Sometimes you can almost guide it in a pattern you like. You can put in one color, let it dry and then add a second color, or use two colors at once. Kids love making these beautiful ornaments too. Some colors I find exceptionally gorgeous are bronze, copper, gold, and silver. You can hang them on your tree or group them in a clear bowl or vase. Just pick a color scheme you like and you'll fall in love with these one-of-a-kind ornaments. You can even use bright or pastel colors and group them in a bowl for a beautiful summertime display. I have seen Christmas balls that are originally clear glass. The balls have paint on the inside that has been swirled around. They were lovely. How do I make them? I have tried with my regular paint and with glass window paint neither did any swirling. Thank you. Just saw this post the other day. They are beautiful! Apparently I'm not good at linking things. Sorry! The kids did these in Sunday School and they came out great. We had them choose 3 colors and put in a small puddle of each all at once. Add each color on a different spot. As they were swirled around they blended with each other perfectly. We let them drain in paper cups and the next Sunday they were drained and dry. Then the hangers were put back in and a ribbon tied around the top. Total amount of paint added up to about size of a dime. The kids were so proud of their beautiful creations. My best advice is to use very little paint at a time and let one color begin to dry before adding a second color. Remember that once you let them sit, the liquid will continue to move. Make sure you put names on them if you are making them with a group because they will not be what you left them looking like when you return. Half the fun is seeing what you end up with. It really is a beautiful craft. Enjoy. I wonder if adding a little water or paint conditioner (you will find this product where the paint sprayers are) will help dilute the paint enough to swirl? I tried making these, but they didn't turn out so well. I swirled the paint in and left them upside down in an egg carton to dry. They looked great at the time, but the next day they looked pretty bad. They had large bare spots where the paint didn't stick. 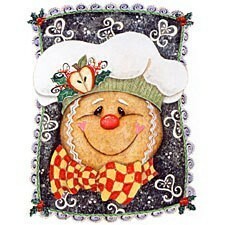 Someone told me to try rinsing the ornaments with alcohol first, but I had the same outcome. Any ideas? Thanks! I just tried to do these, too and the paint wouldn't swirl well. It seemed to be too thick. Then, when I added more paint, it swirled but it wasted so much and the ornament cracked at the top over night while it was drying upside down. What did I do wrong? I used acryllic paint. Check out the above website, it gives good instructions. I make these every year. They are fairly easy to make and it's always a surprise to see how they turn out! My grandchildren painted the inside of ornaments yesterday. The paint swirled great and they look so good this morning, except several of the ornaments cracked at the top. How can we avoid this? How do I get paint to stick on glass ball ornaments? If it is in your budget, get paint made for glass like Gallery Glass. If not, there is an additive that can be purchased from Decoart I believe that is mixed with regular craft paint to work on glass. Also if you just want to paint the balls all over, the easiest way is to remover the cap with loop from the top and pour paint INSIDE the balls, swirl it around inside for a few seconds, then turn it upside down in a styro or paper cup and let the paint drain out. It can be reused. You can do this with a couple of colors and you get a really nice marble effect. I know when you are painting the outside you need to wipe them down with rubbing alcohol. Perhaps you could try rinsing out the inside with rubbing alcohol and allow to dry. I have some clear glass Christmas ornaments that I want to paint for my tree this year. I have a treetop bow that has red birds on it. I would like to paint red birds on the ornaments. My tree is white. Does anyone know where I can find a bird pattern to use? I want to either stencil the bird on or cut a sponge in the bird shape to paint with. Check stickers (or a photo) of the bird you want, then copy it in several sizes - several copies. There is sticky stencil material at craft stores you can put over the copy you want and make a stencil, or just cut out the paper one and use Modpodg or tacky glue to put it on the curved surface. I no longer have photo of the ladybugs of 3 sizes I put on planters. Be sure to get paint that is designed to stick on glass. Lots of paints will flake off from glass. If you can find plastic ornaments, fabric paint, the 3-D kind, works very well. Ask a nearby child to draw a bird for you? let them participate!